Some further disturbing news has been reported to Srila Prabhupada about the state of the temple here. There has been a spate of thefts from both the temple and the guesthouse. When the temple opened a year and half ago, the devotees wanted a high standard of worship and decided to get solid silver utensils to use in the worship of the Deities. Incredibly, almost every silver puja item has disappeared. There were three large, beautiful silver ghee lamps that held multiple ‘stick-wicks’ (wicks about four inches long consisting of a thin layer of cotton wrapped about a thin stick and dipped in ghee) used in the aratis and many silver bowls used for the Deity offerings; now they are all gone. 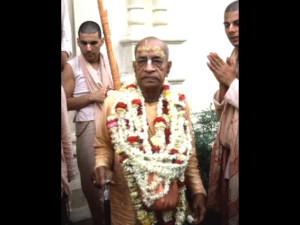 Even the watch on Srila Prabhupada’s Deity has been taken! And in the guesthouse, no visitor’s valuables are safe. Small holes have been gouged in the doors, presumably as spy holes so that when the guests are out, thieves can enter and steal their money and any electronic goods or valuable possessions. When Arjuna and Tamopaha Prabhus were here two months ago they had several thousand dollars stolen from their room. It is a very big problem. Srila Prabhupada is disgusted that the managers have allowed such a situation to develop. He told them not to buy any more silver, to use only brass paraphernalia, and to improve the security in the guesthouse.